I recently decided to give an inexpensive (under $2 USD), thoughtful, zero calorie Valentine's day gift to family and friends this year in place of candy. 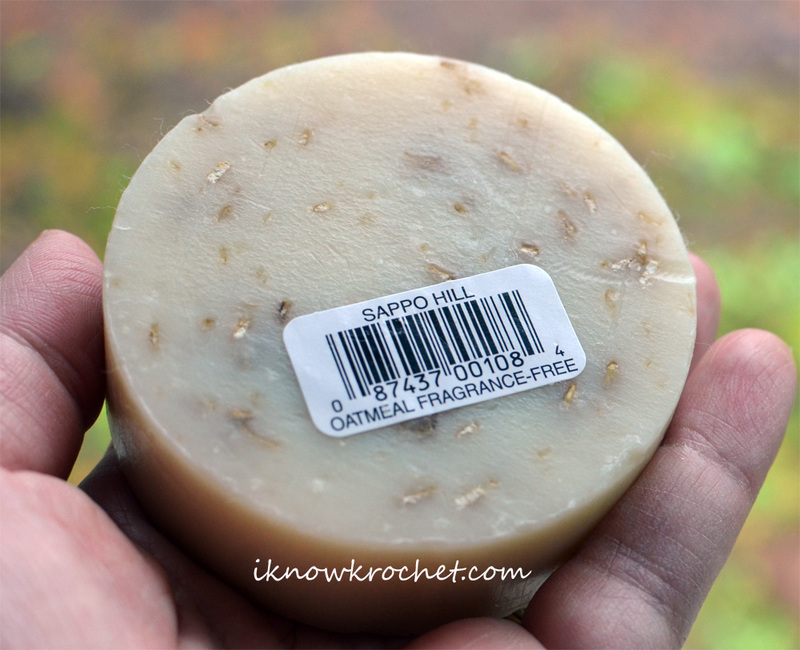 My mother loves the fragrance free oatmeal soap from Sappo Hill. I love giving her this kind of practical gift, but it feels a bit like something is missing when I wrap up a bar of soap. 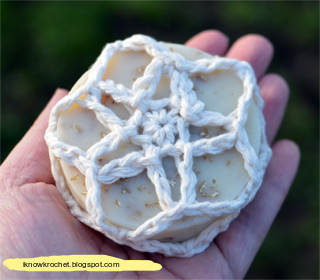 To make a fancier gift, I designed a lacy net-like soap saver with a star design using 100% cotton yarn. 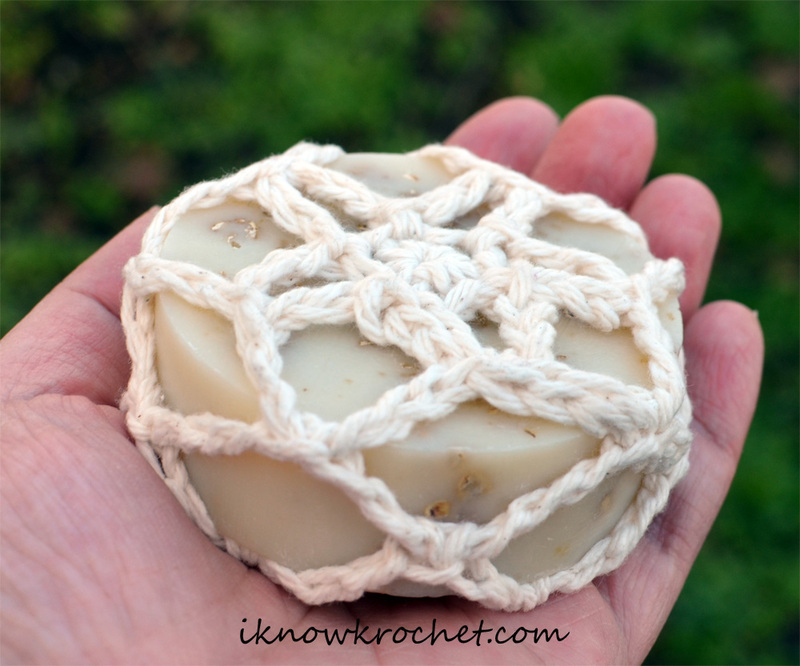 This soap saver is crocheted almost entirely using chain stitches and is super easy and fast to work up (it literally took me 10 minutes to make). It fits snugly on a full bar of round Sappo Hill soap. Weave in beginning strand now. 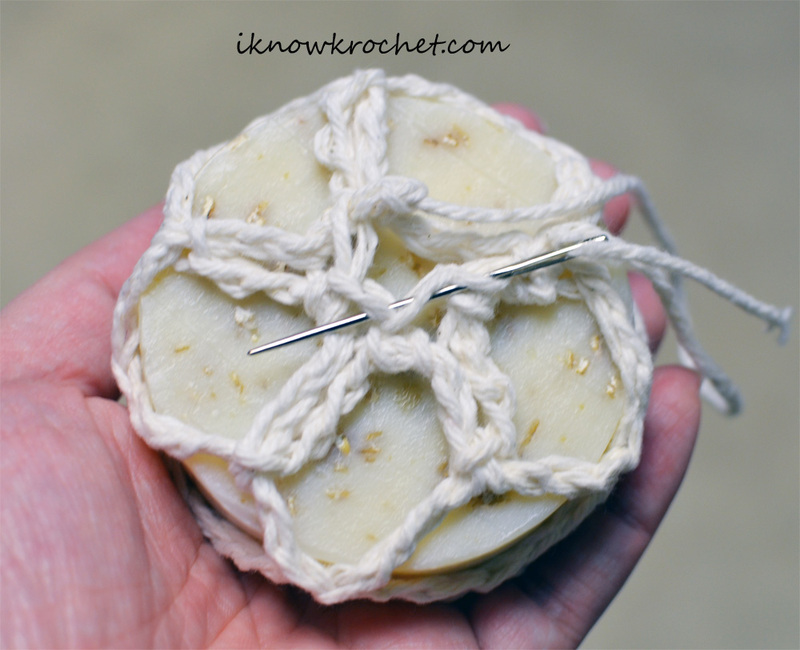 Place net around bar of soap with star from round 2 at the center of one side, pull loops up evenly around edges (see photo). 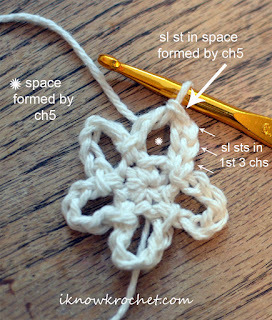 Note that the three slip stitches at the beginning of each round are needed to get into the correct position at the point of each "arm" of the star. Each slip stitch goes into one chain stitch. In contrast to these "positioning" slip stitches, the slip stitches that go into the space of each arm are essentially anchors for the following chain. Note that these anchor stitches do not go into any chain, but rather around the entire loop. 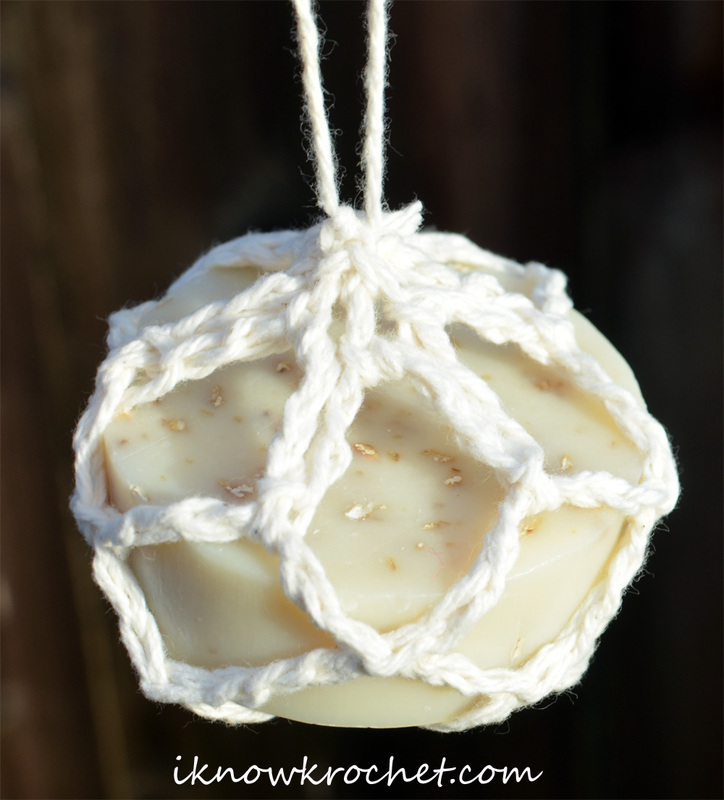 When I wrapped the net around the soap, I had to do some tugging and adjusting to get it to fit because it was pretty snug. Additionally, the last round of single crochet stitches is going to feel a bit tight, but if you focus on one loop at a time, it should work leaving a space in the center that you will close when weaving in the loose strand. I included a hanging loop using the loose strand, but this is optional. I think it looks better without the loop, so if you intend to use it as a decoration that sits next to the sink in a pretty soap dish, then there's probably no need for an additional hanging loop. I must admit I haven't used this soap saver in the shower yet. I expect the net to act a bit like a washcloth, in addition to an anti-slip grip that can be used to set the soap down without using a soap dish. I am not entirely sure how functional this will be as the bar of soap gets smaller, but at least the soap should not slide out until it's smaller than the spaces. I think the best use of this pattern is to make soap look special as a bathroom decoration. It's also makes perfect inexpensive, but thoughtful gift for under $2 USD. I can't wait to give one to my mom! This would also make a great part of a gift set that includes a bath pouf and washcloth crocheted using the same yarn. 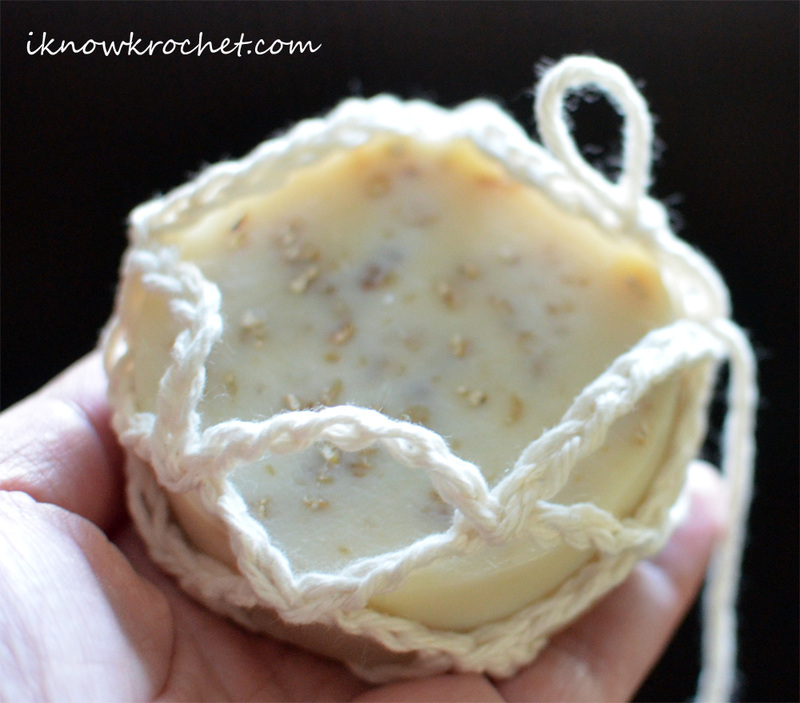 Are you a soap saver connoisseur? What features do you look for in a crochet soap saver?